VATICAN CITY (CNS) — The 2018 World Meeting of Families in Ireland is part of a broad program of renewal of the church’s pastoral care for all families, said Archbishop Diarmuid Martin of Dublin. “In Pope Francis’ mind, the IX World Meeting of Families in Dublin is not an isolated event. It belongs within a process of discernment and encouragement, of accompaniment and animation of families,” he said during a news conference at the Vatican May 24. “It belongs within a program of renewal of the church’s pastoral concern and pastoral care for the family and for families,” he said. Archbishop Martin and Archbishop Vincenzo Paglia, president of the Pontifical Council for the Family, presented the official theme of the encounter, which is held every three years. The gathering is dedicated to “The Gospel of family, joy for the world,” and it will run Aug. 22-26, 2018, in Dublin. The meeting’s preparation and celebration will be inspired in large part, Archbishop Paglia said, by Pope Francis’ apostolic exhortation, “Amoris Laetitia” (“The Joy of Love”), which followed a two-year-long synod process focused on families. The meeting is meant to highlight the Christian ideal of marriage and family life, as well as to be a resource to accompany and encourage all those who “who can’t achieve the Christian ideal” as of yet, Archbishop Paglia said in response to a reporter’s question. It will be about “inclusivity,” he said, in tune with the pope’s approach in his ministry and the postsynodal document. 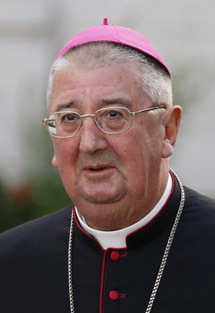 Archbishop Martin said in his talk that “the church’s catechetical programs regarding marriage and the family need a complete overhaul in line with what ‘Amoris Laetitia’ sets out,” and he hoped churches around the world would prepare for the Dublin meeting by sharing in that catechetical process. The gathering is an opportunity to “encourage a very inclusive culture” for people who are struggling and want a more dignified life for themselves and their families, he said. “In the face of the many challenges of a changing culture of marriage and the family, the church is called to accompany families in a new way and to enable families to experience more profoundly the joy of living the Gospel of the family,” he said. “It is also vital that church and society commit themselves to enabling families to experience that joy more fully through appropriate political, social and economic measures which support families and help remove burdens which families face,” the Irish archbishop said. At the news conference, Archbishop Martin again confirmed that Pope Francis would like to attend the meeting in Ireland in 2018, but he said a concrete schedule would be set closer to the actual date of the event. The archbishop said it would be very important for the pope to visit Northern Ireland and bring to completion the 1979 historic pilgrimage of St John Paul II, when rising tensions in the North made a visit there impossible. He pledged the church’s help to make it a success.